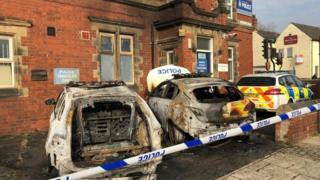 Two police cars were badly damaged in an arson attack outside a South Yorkshire police station. The vehicles were set alight outside Goldthorpe police station at about 02:10 BST, with the blaze damaging the side of the brick building. South Yorkshire Police said a van not belonging to the force was also damaged in the fire. Three men from Barnsley, aged 18, 33 and 35, have been arrested on suspicion of arson and criminal damage. The force said no-one was injured in the blaze. Ch Insp Mark James said: "This reckless incident has left two operational police cars extensively damaged and behaviour like this will not be tolerated. "Thankfully, no-one was injured but the fire has also caused damage to the side of the police station and a council van."